Newly renovated, clean and fresh with natural sun light coming through. 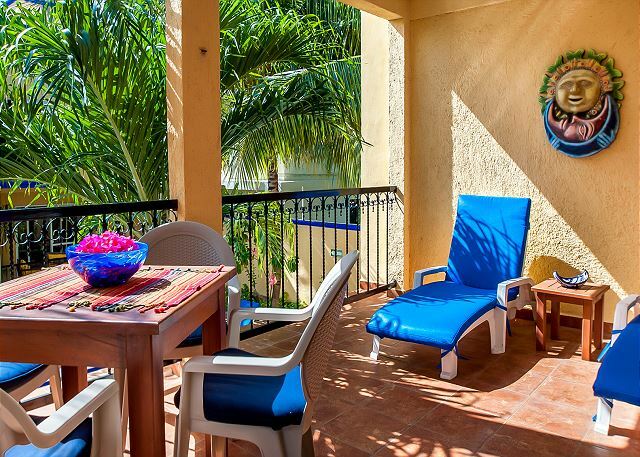 One of the most popular apartments at Abbey del Sol. Huge windows let in the sun and refreshing cross breeze. 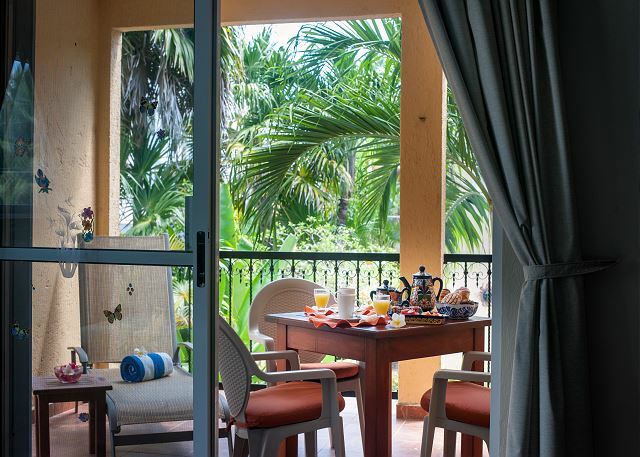 Relaxing private balcony overlooking the sparkling blue pool and lush garden; the perfect place to enjoy your morning coffee and meals. Table, 4 chairs and 2 lounge chairs to relax and read. This is one of our larger apartments, located on the second floor with a new king bed with foam top covered with 500 thread count sheets. Well equipped kitchen with granite counter tops. Free Wi-Fi, bikes, and a large flat screen TV. Linens supplied. Central office onsite with friendly English-speaking staff to help you with anything you need. Yoga classes on the buildings shaded roof in the winter season. Have been staying with Abbey for years, always an amazing experience = that's why we enjoy coming back year after year. The staff make the experience perfect. Hola Tom and Linda, we enjoy having you here! Looking forward to more saling stories. My husband n I spent 10 days at Abbey del Sol and could not have been happier. The staff is fantastic. Mary,Nancy n Jin made us feel right at home. The apartment was very well maintained and the grounds are beautiful. The staff even bought my husband a birthday cake and sang happy birthday to him. We can't wait to return in the near future, hopefully for 2 weeks. Thanks Abbey del Sol for making this one of the most relaxing vacations we have ever taken. Thank you for your kind words, We love to have you stay with us again! Abbey del Sol NEVER disappoints us. The staff and owners are always on hand to help with our queries about where to eat and where to find the best snorkeling. Love it! We enjoy having you here with us! Thank you for baking us the Pavlova, delicious! We loved our stay at Abbey del Sol! The apartment was very clean and, contained everything we needed for a comfortable stay - including beach chairs and bikes for riding around town. The king sized bed was super comfortable and the kitchen fully equipped with quality dishes and pots and pans. It takes less than 5 minutes to walk to the beach. Mariela, Jin and the rest of the staff make this place extra special - they are friendly and very helpful. We can't say enough about how much we liked Abbey del Sol! Hola Tom and Sandy! We loved having you here, we are happy that you enjoyed your stay with us. Don't take too long to come back! We have stayed at Abbey del Sol several times. For our needs, this is a perfect apartment hotel....and we love it. The bed is comfortable, with good bed linens, not sticky sweaty polyester.....the pool is in excellent condition and the kitchen is very well equipped with china, new cooking utensils and pots and pans. Recent improvements to the bathroom have made it lovely. And the staff is simply excellent. Thank you Doug and Vickery , we really appreaciate your feedback and love that our services accommodate you during your stay with us. We hope to have you and your family stay with us next year! It was truly a cozy place to stay. The staff was incredibly nice and the tenants you can tell are repeat customers who have created traditions while staying at the Abbey. Thank you for your feedback, we are happy to hear you enjoyed your stay with us. 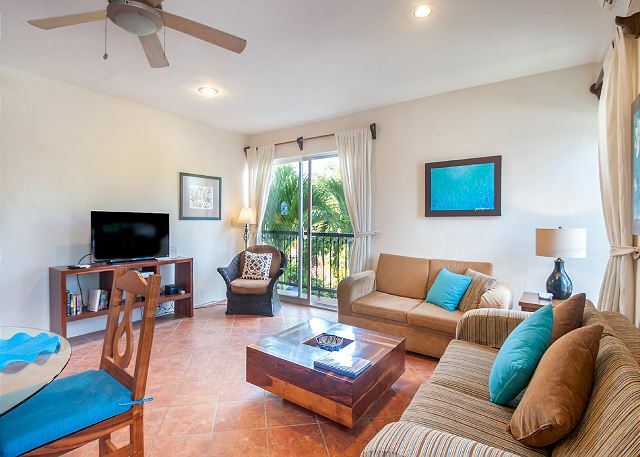 We had an amazing experience at Abbey Del Sol because of the very friendly staff, beautiful property & clean and spacious apartment (#10). Both the Dive Bar Lodge & Unico are a stone's throw away from Abbey Del Sol, which is nice to have a short walk after a long day in the sun. A must stay! A gem in this lovely town, peaceful times on our deck and around the pool for the majority of our stay. Unfortunately the last few days a family moved in whose children were quite loud and performing cannonballs in a small pool for several hours at a time. We enjoyed our stay at Abbey Del Sol. This is our 3rd visit to the property. The accommodation is beautiful, clean and has everything you need for comfortable stay weather one is staying for a week or a month. The staff at Abbey Del Sol are friendly and helpful. Abbey Del Sol is a wonderful place to and we look forward to returning soon. We had an absolutely perfect vacation experience at Abbey Del Sol Apt#10. The online booking was easy with prompt confirmation of booking details and payment schedule. On arrival we were met by Mariela and introduced to Nancy and Milko the office team who were available all week to offer anything we required. Apt.#10 is a large one bedroom clean nicely decorated apartment overlooking the has a large covered deck with table chairs and loungers. 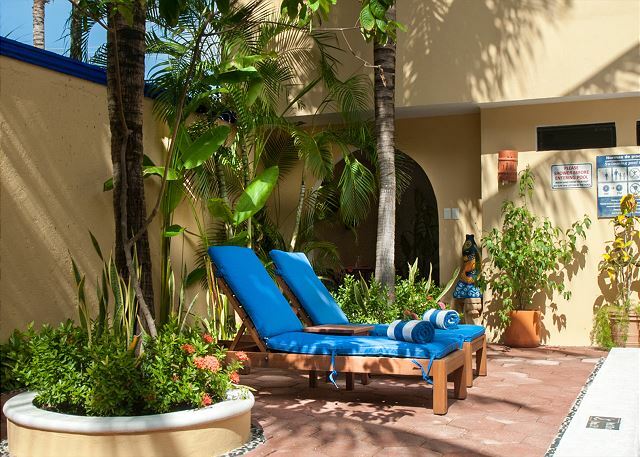 The building and grounds are beautifully well kept with nice gardens and palms surrounding the pool. All staff that we encountered were friendly and polite. 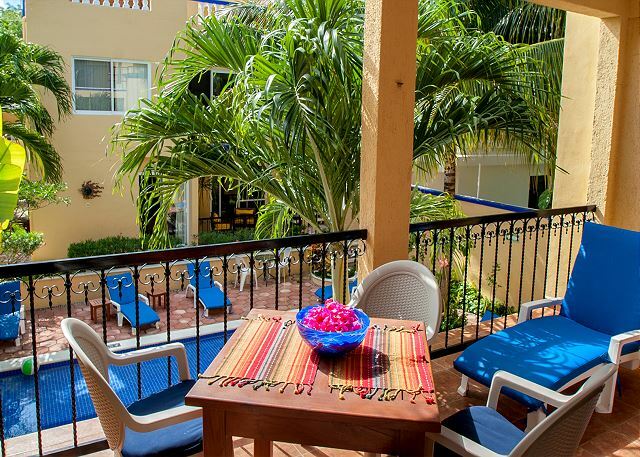 We enjoy a quiet relaxed atmosphere and that's exactly what you get at Abbey Del Sol. All the other quests were polite and easy to talk to. Mariela arranged with Jin to help us move to our next accommodation in Puerto Morelos which was nice. 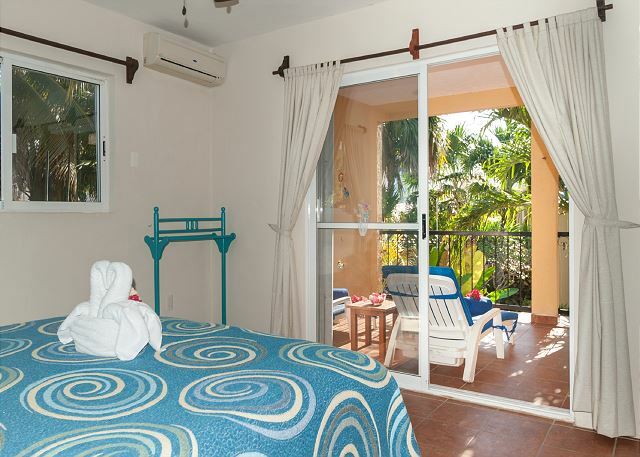 We highly recommend Abby Del Sol and would not hesitate to book here again. Really enjoyed the little fishing town of Puerto Morelos and our stay at Abbey del Sol. Had lots of fun exploring the town on the bikes provided, and lots of wonderful places to eat. Fishing was fun & overall a great experience! GREAT AND COLORFUL PLACE IN GREAT LOCATION! 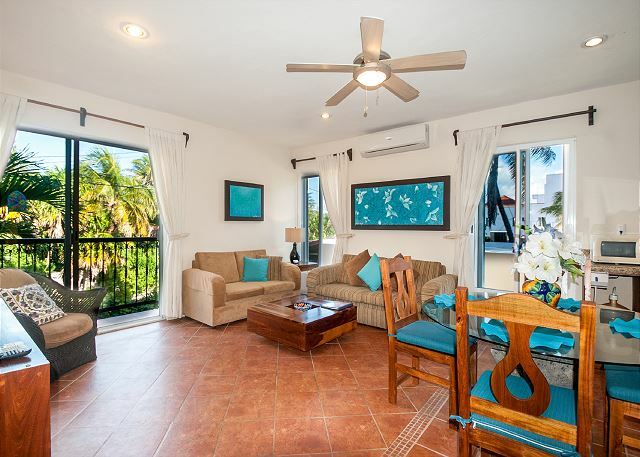 FOUND THIS VERY CLEAN AND COMFORTABLE RENTAL WHICH WAS IN A PRIME LOCATION TO TOWN AND THE OCEAN. WE COULD WALK SAFELY TO RESTAURANTS.PARKED OUR CAR RIGHT ON THE STREET WITH NO PROBLEM. COULD GO NORTH TO CANCUN FOR A DAY AND SOUTH TO CIRCUS DE LE AND PLAYA DEL CARMEN OR TULUM AND DID NOT HAVE THE CROWDS OR EXPENSE OF THE MORE TOURIST CITIES. THE OWNER AND STAFF TOOK GREAT CARE AND PRIDE IN THEIR PLACE AND WOULD DEFINITELY STAY THERE AGAIN! Thank you Edward for comments and feedback on our property , we are very proud of what we have to offer our guest. Thank you for staying with us! Have been long-term renters with Abbey. Unit 10 was as good as it gets. Experience was amplified by the delightful staff - impeccable. We have returned year after year to Puerto Morelos and Abbey. We enjoy the smallness of the town and the less is best regarding tourists. Abbey is always clean, friendly and kept in good maintenance. Friendly and knowledgeable staff. Very comfortable beds, quiet and very clean. Didn't have to ask for anything, they thought of everything! Easy access to beach and restaurants. Free bikes are available for guests. We had a wonderful time in Puerto Morelos staying at Abbey del Sol. The location was perfect, in a quiet part of town but only a 15 minute walk from the square. And the beach is but a short 3 minute walk away. The condo was spacious and inviting. We enjoyed a lunch with the extended family of 11 in the space. We especially liked the veranda overlooking the quiet pool. We highly recommend this place. Hope this doesn't mean Abbey will go with Home Away....bad move!!! Abbey already has a much better system without Home Away. 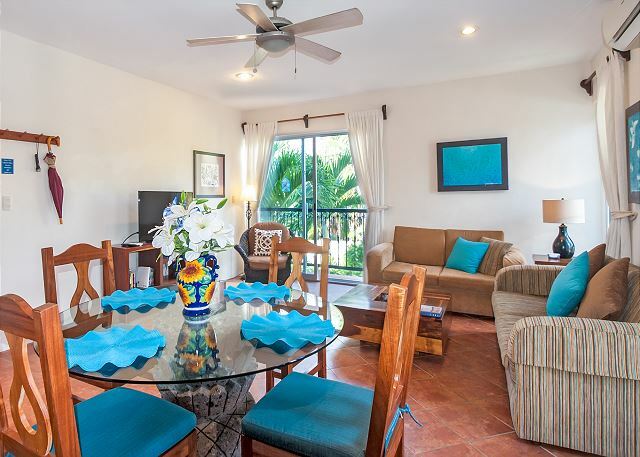 Abbey Del Sol 2 is a great place to get away from the stress and worries of life and just sit back and enjoy a wonderful and beautiful home away from home. Beautiful property, managed by Jin. Excellent staff, including Nancy, Vicky, Hugo, and another fine lady housekeeper that I can not pronounce her name. The staff is always very responsive to your needs, and treat you great. The property and condo are very clean. Everything needed was included. I will return as soon as possible. In all aspects, Staff were very happily to engaging all aspects of your stay. 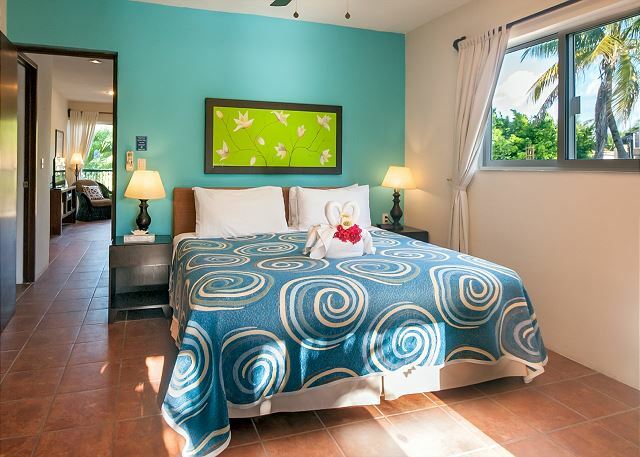 Rooms were very clean and supplied.Very vibrant colors and well stocked kitchen with fresh food just blocks away and beach so close you could feel the salt air.And the towel origami was incredible. Great location, great people overall a great place to stay. After being way from Abbey de Sol for 2 years, we returned to be welcome who not only remebered our faces but also called us by name:). 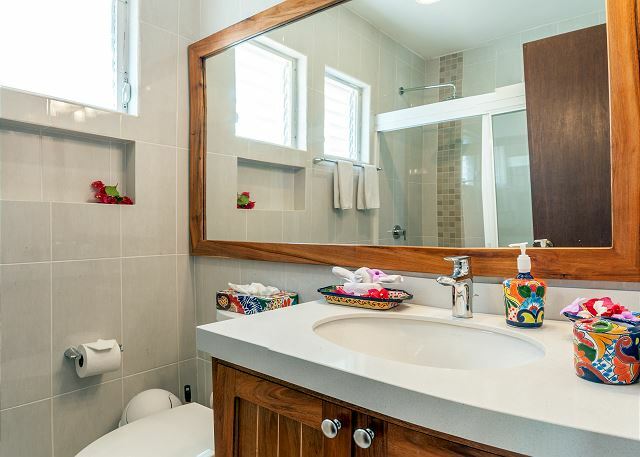 We love the ease and affordability of Peurto Morelos. No wonder we booked Abbey again for next year. We love the staff and their attentiveness. See you next year! Surprises: 1) The bed was AWESOME! Mexico for me, has been known as a country with very hard beds. Unit 10 in Abbey del Sol has a comfy bed - one of the better beds I've slept on. The bedroom gets nice and cool at night. Both of these factors added up to great night's sleeps. 2) the folks who cleaned the room mid-stay really took pride in their work. They made cleaned thoroughly, restocked, and left fresh flowers. 3) the pool is surprisingly cold. We had water served to us at restaurants in town that were warmer than the pool ;) The courtyard is shaded so that explains that. It was still nice - you just had to coax yourself in slowly. 4) One evening, our electricity went out - only in our apartment. We got in touch with Tin who got electricians out and had it working again by the time we went to bed. Here were our favorite restaurants: El Nicho (Breakfast), Unico Beach (Lunch), and My Little Italy (Dinner). We had bloody Mary's a couple of times at Pangea in town - very nice and a good drink. One thing we missed was walking to the other side of the town square for meals. We had all of ours on the north side of the town square but on the last night, we walked past the flea market (blissfully closed at night) and saw several other restaurants we wished we had tried. That's a reason to go back! The people at Abbey del Sol were lovely. Both the guests and the employees but especially notable were Caroline, Nancy, and Tin. All of them so helpful and friendly. Well managed, comfortable suite. Appropriate cooking utensils, cutlery, china, comfortable bed. Quiet atmosphere, close to beach. Walking distance to village. The staff is extremely helpful, and very quick to respond to any requests. Very nice, clean pool and surroundings. Excellent property. Nancy the manager on location provided excellent service. I would recommend Abbey del Sol to anyone! The apartment is well equiped and REALLY clean. We loved the little village of Puerto Morelos; the people were very nice and kind. The only deception was about the seaweeds; we could not swim at all because of the tremendous amount of seaweeds, which was an exceptional situation. We enjoyed a lot the pool, but didn't apreciate the comments about the fact that we were not showering enough to take out the sunscream and that we were giving a "hard time" to the pool... Beside that situation, it was perfect! Wonderful place, will definitely stay here again. Felt like home. Having visited Puerto Morelos over the past 20 years, this was my first time at Abbey del Sol and I was not sure what to expect. It turned out to be a very pleasant surprise. The grounds are lovely and lush, just what you would want in a tropical setting. The availability of bicycles to use to get around was a real plus. Our room was spacious and appointed with everything needed to be comfortable. The staff were gracious and ready to help. I stayed in the unit at Abbey del Sol alone for a few days and then was joined by my wife and our daughter. 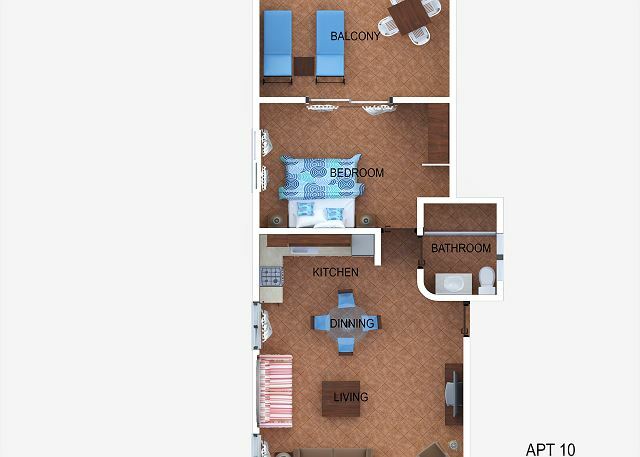 Clean, large rooms, with all the amenities you need. We LOVED our week stay in #10 and the 'swan welcome'. The place exceeded our expectations. The tranquility was much needed and I can't say enough about the great staff--Nancy, Jin & Freddy especially. Spending time with Abby & Tiff was remarkable. PM is such a great place to unwind. Our week plus stay at Abbey del Sol in November 2014 was great. we stayed in Apt #10. After a week at the Now Jade Resort we got away to this quaint peaceful retreat for our honeymoon. It was beyond our expectations, clean and very comfortable. Staff extremely pleasant and helpful. The bicycles were a plus and the best way to get around the town of Puerto Morelos. Easy couple of blocks to walk to the beach. Nice variety of local restaurants with outdoor seating. The property and amenities were exactly as described on the web site. We would definitely spend time here again and would like to stay for an even longer period of time. Always staying at Abbey. It was our second year in a row and have booked for another two years. We love Puerto Morelos and Abbey del Sol is one of the best!! The owners are fabulous. 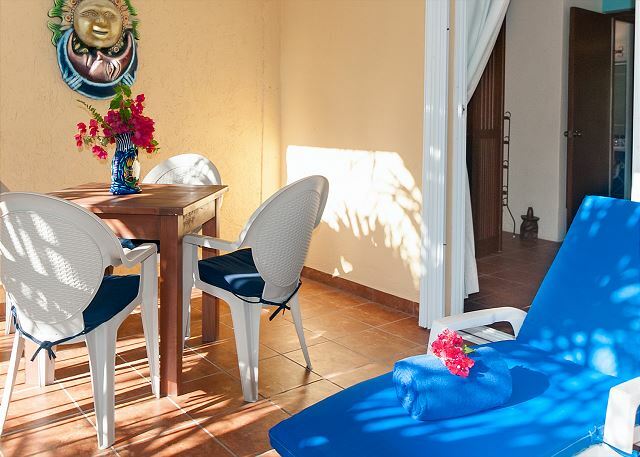 They have gone to a great deal of effort to make one's stay in Puerto Morelos as easy and enjoyable as possible. From the four-page document on their website detailing all the tips and tricks regarding passports, taxis, the airport, directions, money exchange, electrical outlets ATMs and airport transfer, to the friendly, helpful and knowledgeable staff at the front counter, they have taken care of everything. The condo-like rooms are well-kept and clean, with a beautiful view from just about every window. I could not recommend Abbey del Sol more highly. SO wonderful we run out of superlatives to use. 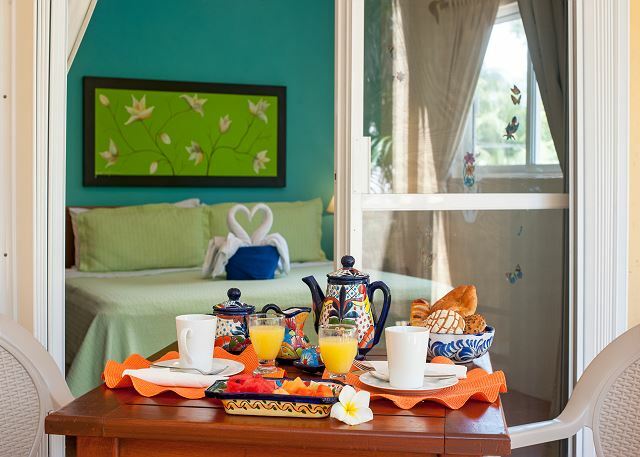 Clean, organized, great staff, wonderful location, soft beds ( a rarity in Mexico), Abbey del Sol has everything you need for a wonderful experience in Puerto Morelos. We spent 11 nights at Abbey Del Sol #2. We lived in Apt. 10 for the first six nights and then moved to Apt. 8 (as Apt. 10 had a prior booking). The setting is perfect. The apartments surround a courtyard and garden with a swimming pool and lounge chairs in the center. The property and gardens are attractive and are well maintained. 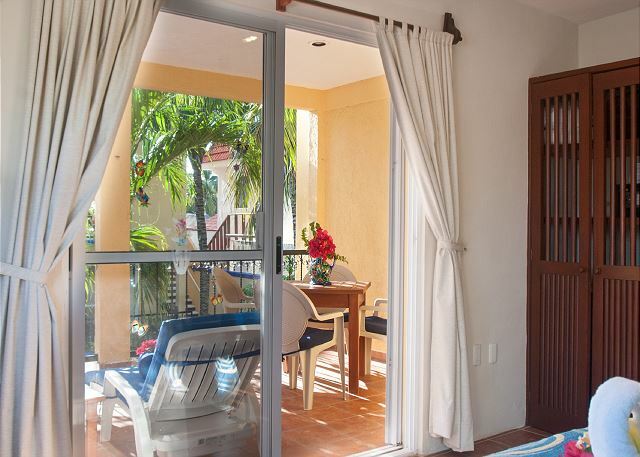 It is only a two block walk to the beach and about a 20 minute walk into the town center. It was always a pleasure to come back to the Abbey. It is quiet and cool. The rooms are equipped with ceiling fans. A/C is also there but we found that the fans were enough. Both apartments we were in were well equipped. We ate both breakfast and lunch on our terrace and then frequented one of the numerous good restaurants for dinner. 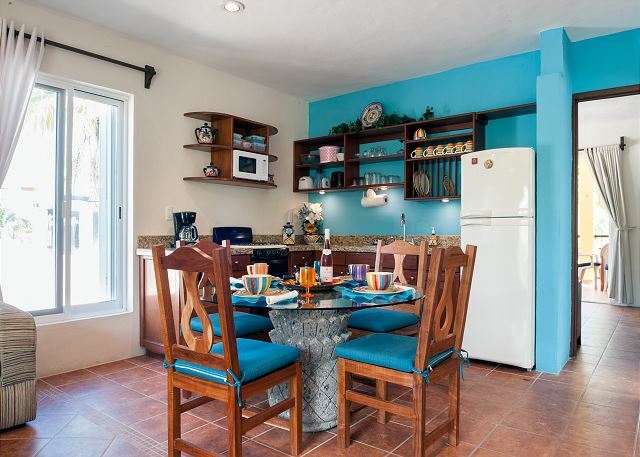 You will find a great book in each apartment which provides lots of information about Puerto Morelos, including a list of recommended restaurants. Abby and Tiff were wonderful and always made us feel at home and welcomed. All the staff are very helpful and friendly. Apt. 10 is considerably larger than Apt. 8 and it also has a very nice balcony with a table and 4 chairs as well as 2 lounge chairs. We really felt at home in this apartment. Apt. 8, though smaller, is certainly comfortable for two. The management and service personnal has been easy-going all the way, always ready to inform and help. No doubt, they are professionnals. The place is nice and generaly well maintained. We loved Abbey del Sol! Abbey del Sol was fantastic. 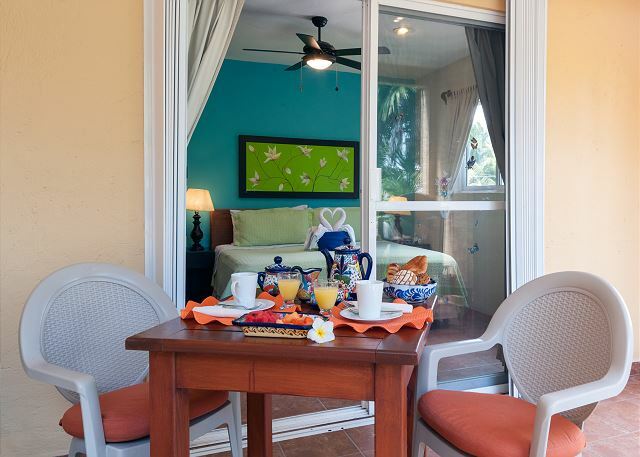 The location was great, close to the beach, the accommodations were well appointed, and the staff was amazing. We can't say enough about our stay here. We were traveling with a 22 month old and Abbey del Sol was perfect for our little guy. We used the pool and the bikes a lot. Do yourself a favour and stay here! 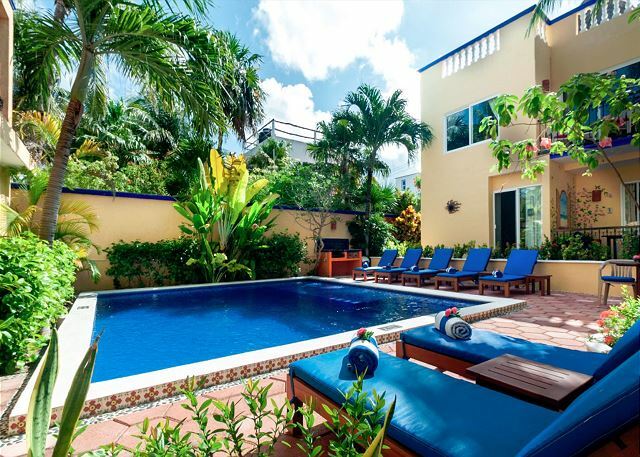 I would recommend this place to anyone looking for a nice place to stay while in Puerto Morelos. While we had a few bumps - we got a different room than we reserved - it was all taken care of quickly and professionally. And, looking back, we actually got put into a room with a nicer patio and the owners went out of there way to ensure we were happy and comfortable. I wouldn't hesitate to recommend it and we would certainly go back. Second year at Abbey 2, but first in # 10 . 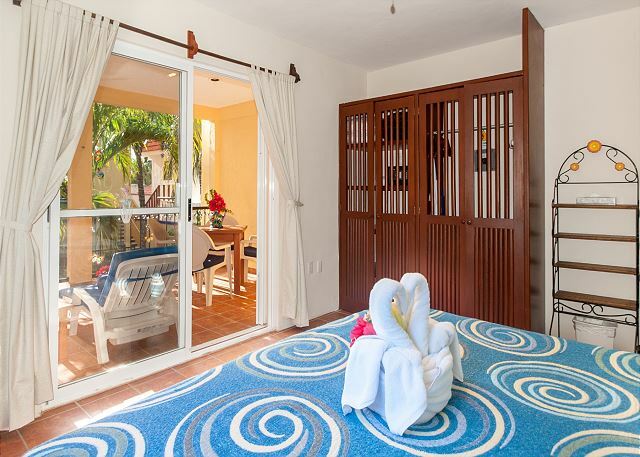 A great cross breeze from front room with a screened door opening to a tiny balcony through to the back bedroom slicing door out to the Hugh balcony complete with hammock, umbrella, table and chairs for 4 and 2 lounges, one with the palm tree hanging over it for shade. It also faces the pool and the garden wall! great place. Really appreciated the extras at no cost- free current movies, internet access, and, especially, the shopping trip to Colonia with Tiff where we stocked up for the week. This is our third visit to Abbey's. 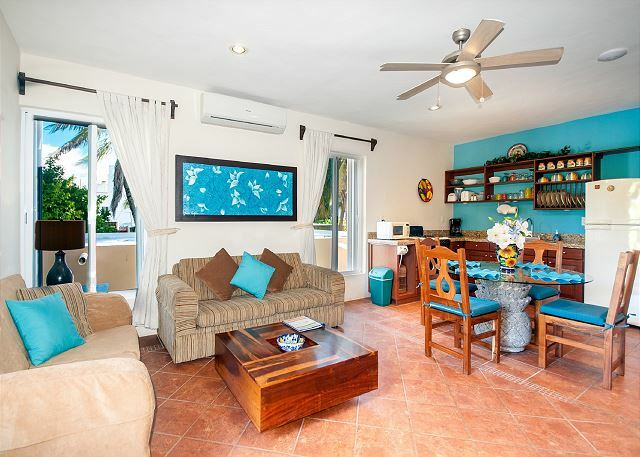 We have been coming to R. Mayan area for 10 years and enjoy the ease of having an apartment/hotel atmosphere. You have control of mean schedule and choice of restaurants. Each meal can be in or out according to your whims and time is your choice. On our stay there was no beach hassle of finding a chair or when to go. Having so many movies to choose from made the rare rainy day pass quickly. You can be busy or you can be lazy...the best of all worlds. We were very pleased with all the logistic aspects of our stay at Abbey del Sol and the many enjoyable extra features: bikes, books, videos. What is outstanding is the attitude of the owners and staff: they make the comfort of their guests their priority and every need seems to have been anticipated and every request is given friendly, attentive consideration. We are recommending it to all our friends and can't wait to return next year. Me and my husband stayed at Abbey del Sol for a week and had a wonderful time. The apartment was spacious and they thought of everything: fantastic beachchairs, beach towels, an umbrella for the beach, free bikes, dvd's, books, a very well equiped kitchen and if you needed transport to Cancun or Playa it was available too for a reasonable price. The staff was very friendly and helpful and the apartment is at a 3 minute walk from the beach. We would recommend the appartment to everyone and hope we will come back one day!